Nebraska has finally plugged the last two holes on its nonconference schedule and the program released the full slate on Wednesday featuring at least four NCAA Tournament and two NIT teams from a season ago. It begins officially on Nov. 6 against Mississippi Valley State, but first Nebraska will host Division II Wayne State in an exhibition game on Nov. 1. The Wildcats have a handful of local players on their roster who are former teammates of some current Huskers. Walk-on junior guard Johnny Trueblood (Elkhorn South) played summer ball for Omaha Sports Academy alongside Wayne State senior guard Vance Janssen (Blair), while freshman Brady Heiman (Platteview) also played at OSA alongside Wildcat freshmen Nick Ferrarini (Millard North), Jordan Janssen (Lincoln East) and Nate Thayer, who was also a high school teammate of Heiman’s at Platteview. Nebraska’s first test against a high-major opponent will be on Nov. 14 in the Gavitt Tipoff Games against Seton Hall out of the Big East. Nebraska will face Missouri State and one of either Texas Tech or USC in the Hall of Fame Classic on Nov. 19 and 20. The first of four Saturday games during the nonconference slate will be on Nov. 24 as the Huskers host Western Illinois, and two days later the Huskers will hit the road to to take on Clemson in the ACC/Big Ten Challenge for the second time in three seasons. The Tigers won 24 games last season and made it to the Sweet 16. After two early Big Ten games against Illinois and Minnesota to accommodate the 20-game slate, Nebraska will dive back into non-league play with a Saturday showdown against in-state for Creighton on Dec. 8 at Pinnacle Bank Arena. The Jays made the Big Dance last season and have won seven straight games in the series but lost their top two scorers, one to graduation and the other to the NBA Draft. 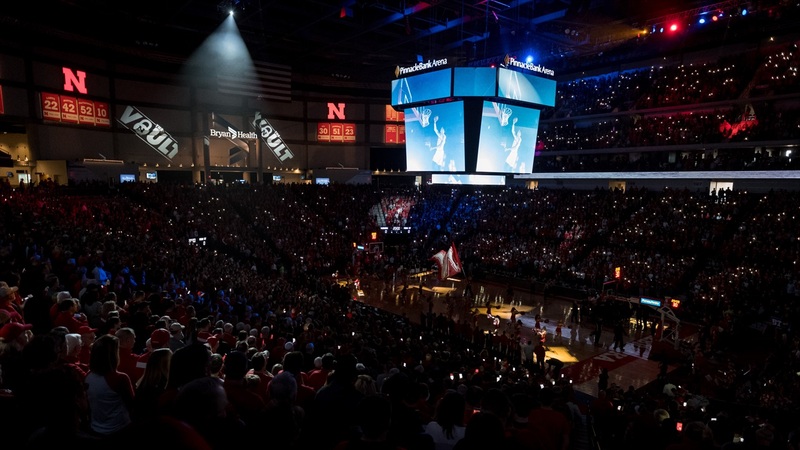 Nebraska will travel north to the Sanford Pentagon in Sioux Falls, South Dakota on Dec. 16 for a neutral-site game against Oklahoma State, a team that made it to the NIT quarterfinals last season. Finally, the Huskers will return to Lincoln for consecutive Saturday games to close out the nonconference. On Dec. 22, the Huskers will face a Cal State Fullerton team that went 20-12 last season and qualified for the NCAA Tournament. On Dec. 29, Nebraska will wrap things up against Division II Southwest Minnesota State. The Huskers return their top four scorers from last season’s squad that finished 13-5 in the Big Ten and qualified for the NIT.